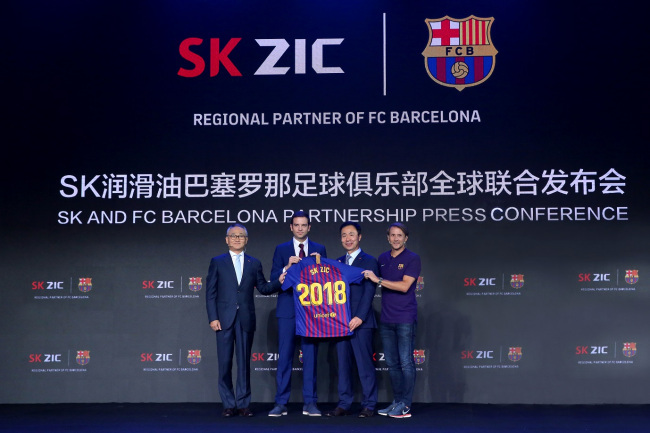 SK Lubricants’ brand SK ZIC has signed a three-year sponsorship deal with FC Barcelona in its latest move to boost brand recognition and sales, the firm said Sunday. SK Lubricants -- owned 100 percent by South Korean refiner SK Innovation -- became the first South Korean corporate sponsor of FC Barcelona since the football club’s foundation in 1899. “We plan to increase SK ZIC’s brand recognition and global sales through the sponsorship,” SK Lubricant said in a press release. The announcement event for the sponsorship was held on Saturday in Beijing. The sponsorship has been effective starting July 1 to cover five countries including South Korea, China, Russia, Vietnam and Thailand. The agreement will enable SK Lubricants to use the logo of FC Barcelona and images of its players in all areas related to SK ZIC in the five countries, the company said. “China and South East Asia are significantly growing lubricant markets that need more than 85 million barrels of lubricants a year. Through the sponsorship, we plan to increase our premium products’ recognition and global sales by associating soccer fans’ awareness of the world’s best football club and its favorability,” SK Lubricants said. SK Lubricants is the first Korean company to have introduced a brand concept of lubricants in 1995 and has since launched SK ZIC. SK ZIC was selected as a “National Brand” given by Russian Chamber of Commerce and National Brand Selection Committee in the category of engine oil in Russia last April. The sponsorship announcement was followed by SK Lubricants’ launching of a new SK ZIC product in China. Developed according to SN Plus, a new engine oil standard established by America Petroleum Institute, the new engine oil is 100 percent synthetic base oil using Yubase, base oil developed by SK Lubricants’ technology, offering improved fuel economy compared to products developed according to old SN standards.